Thursday 2nd May at Huntingdon Library from 1.30pm - 3.00pm. Spectres of Desire: EngAGE in the Afternoon. Back by popular demand - winter and academic Professor Catherine Belsey takes a fresh look at ghosts in fiction. Free (donations welcome) booking required. Please speak to library staff or call 0345 045 5225 for a ticket. Free Comic Book Day on Saturday 4th May 2019 at Niche Comics and Bookshop. 9.00am - 5.30pm. If the weather behaves it will take place in the garden. There will be cake! Wednesday 8th May from 10.00am - 1.00pm at All Saints Church in Huntingdon. Please join in for delicious homemade refreshments, have a got at the tombola and raffle stalls and browse the wide range of handcrafted goods on the craft stalls. A meeting of the Annual Council. 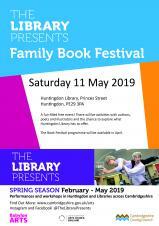 Saturday 11th May 2019 at Huntingdon Library, Princes Street, Huntingdon, PE29 3PA. A fun filled free event! There will be activities with authors, poets and illustrators and the chance to explore what Huntingdon Library has to offer. The Book Festival programme will be available in April. 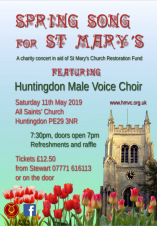 On Saturday 11th May 2019 at All Saints' Church, Huntingdon, PE29 3NR. Doors open from 7.00pm for a 7.30pm start. There will be refreshments and a raffle. 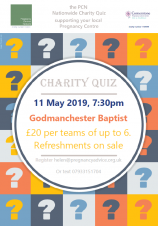 The PCN Nationwide Charity Quiz, supporting your local Pregnancy Centre. Raising money for Cornerstone Pregnancy Advice Centre. A meeting of the Media Sub Committee. On Saturday 18th May 2019 at Huntingdon Market Square from 10.00am - 5.00pm. Huntingdon is set to get a little hot under the collar with its fifth popular Chilli Fiesta. Organisers, Chilli Fest UK, are back for Huntingdon Chilli Fiesta 2019. The event will host chilli producers from all over the UK exhibiting chilli products fro mild to extreme hot sauces, dips, jams, cheese, chocolate, cooking sauces and more. Story telling and creative writing workshop with the Museum of Archaeology and Anthropology. Handle Pacific objects from the museum collections in this writing and story telling workshop. Using games and exercises, imagine what the objects might have seen on their journey to Cambridge. Learn about the historic links between Cambridge people and Pacific islanders and reflect how our community is connected to others around the world. Hear the true stories behind grass skirts from Papua New Guinea, Fijian clubs and shark tooth swords from Kiribati. 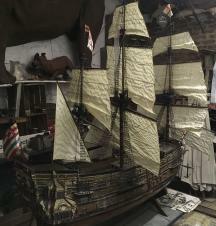 For May Half term, 25th May - 2nd June 2019, come and see one of our recent acquisitions on display for the first time, a huge 1/32 scale model of the flagship of Cromwell's navy, the 'Naseby', launched in 1655. Discover the story behind this remarkable model – one which links Oliver Cromwell with 'Star Wars' and the Muppets! Join Huntingdon Racecourse for their final race day of the season at Huntingdon Racecourse. As well as brilliant racing on track, expect a feast of family entertainment to celebrate another fantastic season for friends and family to enjoy. Hartford Friendship Club on 24th April at 11am at Hartford Village Hall. A new club for those looking to meet new people and to perhaps escape day time TV! Tea and coffee will be served along with cake. The Club will meet on the last Wednesday of the month. Each month there will be entertainment and brief talks from local organisations. A meeting of the Leisure and Community Services Committee. HTML5 validated. WCAG compliant. Page generated in 0.118 seconds.